3DS owners have a lot to look forward to come May 8th, since two RPGs are hitting the 3DS eShop that day: KEMCO and MAGITEC‘s Grinsia and Genius Sonority’s The Denpa Men 3. 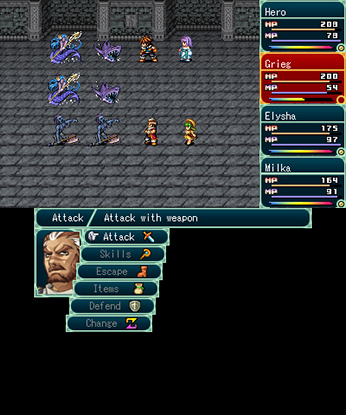 Grinsia is a 3DS port of a mobile game from the prolific developers at KEMCO and MAGITEC. Its 3DS iteration features use of both screens, better controls, and more. Publisher Nicalis (of Cave Story fame) is helping with the port. Price is not yet set. The story revolves around a set of adventurers seeking the treasures of the goddesses who created their world. To do so, they’ll be exploring a recently unearthed temple where the goddesses were said to worship. Back in March, we learned that The Denpa Men 3: The Rise of Digitoll was slated for Western release, and now it finally has a release date in North America and Europe. It will be a 3DS eShop exclusive, priced at $9.99 USD. Also, there’s a demo coming on May 1st, 2014. The Denpa Men series is all about using the wireless function and camera on the 3DS to find and capture creatures known as Denpa Men, who act as your warriors in the game. The main new addition of The Denpa Men 3 is Digitoll, a set of islands where your Denpa Men can live. Editing Manager Jeff had a good time with the original, so unless you’re burned out on the formula, it’ll probably be worth picking up.